Elijah Muhammad was the leader of the Nation of Islam ("Black Muslims") during their period of greatest growth in the mid-twentieth century. He was a major promoter of independent, black-operated businesses, institutions, and religion. Elijah Muhammad was born Elijah (or Robert) Poole on October 7, 1897, near Sandersville, Georgia. His parents were former slaves who worked as sharecroppers (farming the owner's land for a share of the crops) on a cotton plantation; his father was also a Baptist preacher. One of thirteen children, his schooling only lasted until he was nine; then Elijah had to work in the fields and on the railroad. His light skin color made him even more aware of the injustices (unfair treatments) that had been done to his ancestors. He left home at age sixteen to travel and work at odd jobs. He settled in Detroit, Michigan, in 1923, working on a car assembly line. Poole became an early follower of W. D. Fard (c. 1877–c. 1934), the founder of the Nation of Islam, a religious faith practiced by Muslims in which Allah is the one god and Muhammad is his prophet (one who speaks through messages from a divine source). Fard appeared in Detroit in 1930, selling silk goods and telling his customers in the African American ghetto of their ancestral "homeland" across the seas. Fard proclaimed Islam the one correct religion for African Americans, denouncing Christianity as the religion of the slave masters. Soon Fard announced the opening of the Temple of Islam. It featured an unorthodox (nontraditional) form of Islam, but the movement also emphasized African American self-help and education. Fard disappeared, as mysteriously as he had arrived, in the summer of 1934. The movement he had founded quickly developed several smaller groups. The most important was led by Poole, who had become a top leader to Fard and who had changed his name along the way to Elijah Muhammad. The movement had long had a policy of requiring members to drop their "slave" names. behavior—drugs, the use of foul language, gambling, listening to music, and dancing were all not allowed. Muhammad also revised the religion of the movement. Under his system Fard was proclaimed the earthly representative of Allah, and Elijah Muhammad was his divinely appointed prophet. Muhammad also taught that black people were the original human beings and that white people had been given a temporary privilege to govern the world. That period, however, was due to end soon; the time was at hand for black people to resume their former dominant role. In 1942 Muhammad was one of a group of militant African American leaders arrested on charges of violation of the draft laws. He was accused of sympathizing with the Japanese during World War II (1939–45; a war fought between the Axis—Germany, Japan, and Italy—and the Allies—England, France, the Soviet Union, and the United States) and of encouraging his members to resist the military draft. He had, indeed, argued that white people oppressed (forced down) all people of color, and that it made no sense for African Americans to fight those who were victims of white discrimination (an unjust treatment or judgment because of differences) as much as they themselves were. For his words and actions Muhammad spent four years, from 1942 to 1946, in a federal prison at Milan, Michigan. Small groups of like-minded individuals occasionally withdrew from Muhammad's movement. In the early 1960s Muhammad came to be overshadowed by the charming Malcolm X (1925–1967), leader of the New York Temple. In 1964 Malcolm X founded his own movement, which moved toward a more traditional form of Islam. However, Malcolm X was assassinated on February 21, 1965. 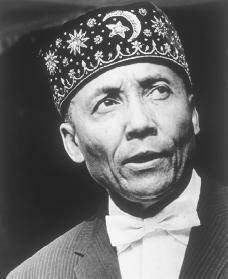 Elijah Muhammad died on February 25, 1975. After his death the leadership of his movement passed to his son, Wallace (now Warith) Deen Muhammad, who renamed the movement the World Community of Al-Islam in the West, and then the American Muslim Mission. Warith Muhammad relaxed the strict dress code, abandoned resistance to military service, encouraged members to vote and to salute the flag, and even opened the movement to white people. In general, he made the movement much more conventionally Islamic. Many members were disturbed at the movement's new, moderate direction. The most important of them formed a new group called the Nation of Islam, led by Louis Farrakhan (1933–). Farrakhan generally retained Elijah Muhammad's ideas and practices. Clegg, Claude Andrew, III. An Original Man: The Life and Times of Elijah Muhammad. New York: St. Martin's Press, 1997. Evanzz, Karl. The Messenger: The Rise and Fall of Elijah Muhammad. New York: Pantheon Books, 1999. Halasa, Malu. Elijah Muhammad. New York: Chelsea House, 1990.